North Lodge is situated on Mill Lane - the B3055, not far from the railway line, and at the end of a track running north-west from Brockenhurst House. 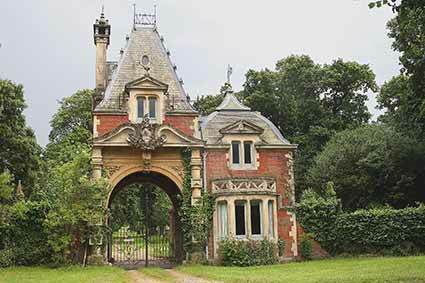 North Lodge is an extravagantly ornate, brick-built, 19th century chateau-style gatehouse belonging to Brockenhurst Park. The Morant coat of arms can be seen in the centre above the archway, whilst living quarters are on the right hand side, and over the gateway. North Lodge was designed by the influential Victorian architect Alfred Waterhouse (1830-1905), who was particularly associated with the Gothic revival in building styles, and use of Renaissance features.